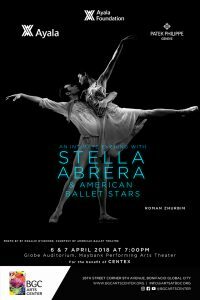 Ayala Foundation, the social development arm of the Ayala group of companies and a leading advocate in community development, welcomes internationally acclaimed Filipino-American prima ballerina Stella Abrera, together with eight other American Ballet Stars, for a series of whimsical performances that are sure to excite ballet fans of all ages. 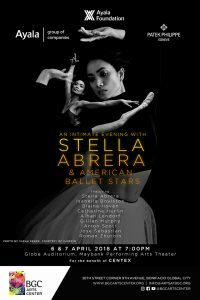 “An Intimate Evening with Stella Abrera and American Ballet Stars” will be staged at the Maybank Performance Arts Theater in Bonifacio Global City on April 5 to 7 in time for the 20th anniversary of CENTEX (Center of Excellence in Public Elementary Education), Ayala Foundation’s flagship education program. 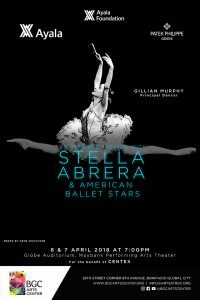 The exceptionally talented Abrera—who made her Manila debut in Ballet Philippines’ 2014 production of Giselle—will be joined onstage by fellow American Ballet Stars Alban Lendorf, Arron Scott, Blaine Hoven, Catherine Hurlin, Gillian Murphy, Isabella Boylston, Roman Zhurbin, and Jose Sebastian. “Dear CENTEX Scholars, it is my honor and privilege to work for your school. Your determination and grace are so inspiring and I look forward to meeting you soon!” Abrera said, adding that when she last performed in Manila, she had set up a small charity (Steps Forward for the Philippines) to help a school that been destroyed by super-typhoon Haiyan (Yolanda) and visiting the school in Guiuan and meeting many of the students, proved to be one of the most moving and inspiring experiences of her life. The first partnership between Abrera and Ayala Foundation, the shows benefit CENTEX, which celebrates its 20th anniversary this year, provides a holistic learning experience for bright students from underprivileged families, as well as their parents and public school teachers. To date, over 1,500 students have graduated from CENTEX’s two campuses in Tondo, Manila, and Bauan, Batangas. It has also helped enhance the skills of more than 800 teachers and principals from 20 public elementary schools through a teacher-training program, which serves Ayala Foundation’s way of replicating the CENTEX experience in different parts of the country. Zobel Elizalde has always had a heart for theater and dance, as she believes this an often overlooked discipline in the country. “It is so important to have arts available to all students as it gives these children a chance to experience a strong discipline, learn a beautiful art form, and build their self-esteem,” she says. 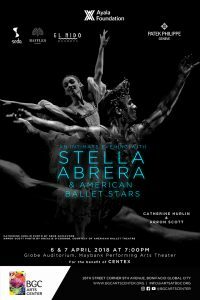 Co-presented by Patek Philippe, “An Intimate Evening with Stella Abrera and American Ballet Stars” Is also supported by the Ayala Corporation, Ayala Land, Bank of the Philippine Islands, Globe Telecom, Airswift, Raffles Makati, Seda Hotels, El Nido Resorts and Steps Dance Studio. Catch the shows on April 5 to 7, 2018 and experience the full richness of ballet.